Ornella and her father and mother. Our kids and employees were present for the recognition. Other guests included Donald W. Koran, US Ambassador to Rwanda, Bruce Korgh, Director of Carnegie Mellon Rwanda, Christine Whitekettle PA and Tom Macgreager, of the UK NGO Food for the Hungry. Tresor giving speech with Urukundo kids looking on. "I am by the names of Cyubahiro Tresor speaking on behalf of Urukundo Foundation children. For us children, this is a family which has a lot of meaning to us that we can not get enough words to express it. Among all that this family means to us, we can now speak about some of them. First of all, Urukundo Foundation means a family to us children as we have parents who are close to us and who knows our needs and provide us with the needs. From the first day that we became a part of this family till today, this family does all it can trying to make each of our new days brighter according to its financial capacity and we really do appreciate that. We are given love by our guardians for everyone is not living for herself or himself but rather lives for all of us children in the family. 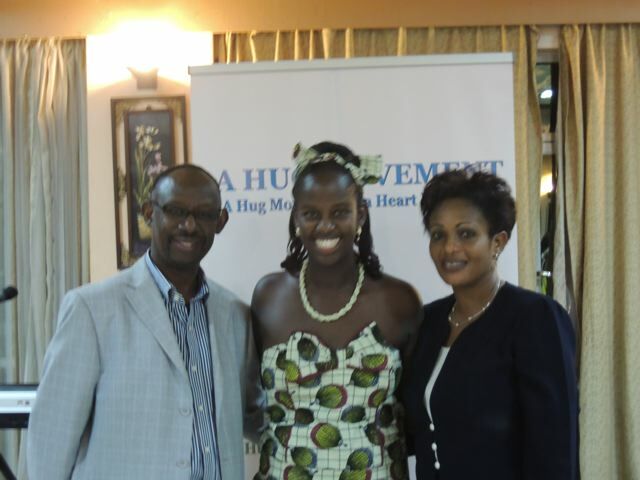 A first and a good example to this was set by Mama Arlene, who left her country, her kindred and all she could get from her family and came here in Rwanda to live with us, people she had not known, but because of the love she has, she came all the way to our country to be an answer to some of our prayers that we always said to God. And right now our eyes can show us how powerful the decision she made was. On behalf of the children of this family, I’d like to say that it means more than anyone can think of. We know and we hope that our Mama and all others who help to make this family that they wish and plan a better and a brighter future and more for it is a family driven by love as we all know. Love does it all. I can say a lot about this family and how important it is to us children and the country at large but even if I don’t say more to this, our eyes can show everyone that this is a great family that the Lord God has made and blessed. I can not end this speech without thanking Mama Arlene for all she did, all she does, and all she plans to do for her children and the country at large, may the Almighty God bless her very much. I’d like also to thank all other people who try their best to help this family to go on with the work it does, may the Almighty Father bless them so much. I can not also end this speech without thanking our Government which gave her a place in our country, which believed she can contribute a lot to this extent and allowed her to be here doing all this work she is doing. May our heavenly Father bless you so much. Once again organizers thank you for your invitation, and for all attendants thank you for your attention.